In the last Republican Debate, where the candidates gave their points of view about economics, Mitt Romney used the forum to deceive the American public once again. During the debate when the Candidates were asking each other questions, Governor Rick Perry asked Mitt Romney why did "Romneycare" in Massachusetts increase small business premium healthcare cost of 16%? Mr. Romney immediately chided Gov. Perry with incorrect attacks. For example, Mr. Romney stated that “under Perry's watch, one million Texas children are uninsured”. Mitt Romney was not accurate in his attack. He stressed that the cause of uninsured children in Texas was due to greater inequality, but he also claimed that in Massachusetts "We have the lowest number of kids as a percentage uninsured of any state in America. You have the highest....under President Bush, the percentage uninsured went down. Under your leadership, it's gone up." But while Romney might have been accurate on the number of uninsured children in Texas, the reasons are not exactly what Romney claimed. For instance, unlike Massachusetts where parents have lost the right to make choices for themselves and their children when it comes to healthcare, in Texa,s healthcare is still a matter of choice and personal freedom. It has little if any to do with poverty or inequality. The health insurance he quotes above is the same one that Romney wrongly coerced citizens into obtaining as a mandate, and the same one that prevents families from poverty and protects children from becoming uninsured. So while the number of uninsured children in Texas may indeed be 1,000,000, the reasons for these numbers are not the cause of poverty, or lack of legislation to protect children in Texas, as Romney claims. In fact, Texas is among one of the states that has passed more legislation to guarantee healthcare access for children. Furthermore, unlike in Massachusetts where businesses, private citizens, and parents do not have the right to make choices since “Romneycare” is a mandate, in Texas parents have had that right and have opted out of the state and federal healthcare program like CHIP (Children’s Health Insurance Program). In essence, while Romney in Massachusetts forced families into a mandate and made small business pay for any additional cost, in Texas parents have been opting out the programs for the last 2 years, even if the cost is only $25 per family. Many families have chosen not to insure their children at their own expense. So while the 1 million number of uninsured children may be accurate, it is not due to Governor Perry’s apathy as a Governor. According to Politifact, in Massachusetts, there were 51,400 uninsured children, that is, birth to age of 18, or 3%. Of those with insurance, 65% received it from an employer and 29% received it from Medicaid. In comparison, Texas had 1,303,000 children without insurance over the same period, or 18%. Of those with insurance, 42% received it from employment, 35% received it from Medicaid, and 3% from an individually purchased plan, and 2% from other public plans. However, in Massachussetts the cost to businesses to insure children is 65% under Romneycare, while in Texas it is only 42%—a 23% difference and a burden on business owing to Romneycare. Furthermore, while one million may sound like a lot, when one compares the population of Texas of 25 million compared to only 6.5 million in Massachusetts, the numbers are more in favor or Texas. In other words, Texas has 4 times the population of Massachusetts. One million children in Texas will be equal to 250,000 children in Massachusetts. In fact, during the fiscal year 2008-09, the number of children eligible for CHIP in Texas was 6,442,738, but only 1,441,774 were eligible in Massachusetts. According to the 2010 U.S. Census (from 2008 to 2010), Texas had 51% of children under the age of 18 who were 200% below the federal poverty line; however, only 11.5% were uninsured. In Massachusetts, 30.1% of children under the age of 18 were below the 200% poverty line, but only 1.6 were uninsured or there were 51,400 uninsured children, or 3 percent. Of those with insurance, 65% received it from employment and 29% received it from Medicaid. However, uninsured children are not the result of policies aimed at helping poor families but rather a lack of information or choice. Furthermore, in Texas, 64% of families live with an income above the poverty level. Also, only 15% of families in Texas live between 150 to 200 below federal poverty level, which makes them eligible for CHIP in which they would have to pay only between $25 to $50 dollars to be enrolled. 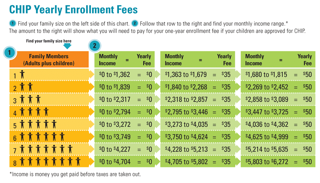 Enrollment fees are $50 or less per family, per year. Most co-pays for doctor visits and prescriptions range from $25 to $5. Moreover, under CHIP, a family making only about $10,000 a year, with as many as 8 children, pays the same amount of $50 as those families with only 1 child. Therefore, it is mathematically impossible to think that a family of making $10,000 did not have $50 to pay for their family health insurance under CHIP. The choice of the family not to insure the children is their decision based on finances, priorities, or other factor not on the fact that there is no option for insurance. Hence, Mitt Romney’s accusation that Governor Perry’s Governorship has caused children to not have health insurance is untrue. So while Mitt Romney presumes that the rate of uninsured children in Texas is the lack of policies addressing the needs of the poor the evidence shows otherwise. In fact, in Texas there are ample federal programs guaranteeing access to healthcare to families with a of cost next to nothing. However, unlike in Massachusetts where the state government forces parents in the program, in Texas parents are responsible for enrolling their children in a healthcare program. The reality is that some parents still opt out of the programs, or are unaware of such programs. The alleged 1,000,000 uninsured children in Texas is matter of personal choices or lack of information, but it has never been about poverty, low-income, and inequality. More importantly, Massachusetts is a liberal state where citizens and families are comfortable in allowing government bureaucracy to organize their lives. Conversely, in Texas, families still enjoy the meaning of personal freedom even when opting out of insurance coverage for their family. Therefore, a Texas “RomneyCare” mandate could never be implemented in Texas because of the state’s character of self-reliance and freedom to make your own choices, thanks to Governor Perry. I was appalled at your gross mischaracterization of the plight of Texas' uninsured children. I'm an insurance agent who works with parents trying to insure their children every day. And, nothing could be further from the truth than your statements which imply that Texas parents "choose" not to insure their children in great numbers. CHIPS is wonderful, if you're nearly destitute and insolvent. It's great coverage and it's priced right for the indigent. IT'S ABSOLUTELY NOT GREAT FOR THOSE WHO MAKE ANYTHING MORE THAN POVERTY BECAUSE THEY'RE INELIGIBLE FOR THE PROGRAM. So, where do they turn unless they have a job that offers benefits? Well, they used to be able to simply purchase a child-only policy from any of our eight major health insurers. But they can't anymore. Why? Because the insurers en mass terminated the sale of new child-only policies when Health Reform required them to offer coverage to all children, sick or healthy. THEY DISCONTINUED SALES OF CHILD-ONLY POLICIES EVEN TO THE HEALTHIEST OF TEXAS' CHILDREN. And, Perry and the Republican legislature didn't do one thing to remedy that situation. At the time, I thought that was so out of character for Perry that he must be going to run for President, so, he needed to do the most heartless and inhumane things known to man to get through the Tea Party's stranglehold on the nomination process. He also would need the money from the insurers to run. I hate being right all the time. Perry's running. And, don't say that that sick kids can go to the Texas High Risk Pool. Have you seen those prices lately? If a parent can't afford health insurance for the whole family and only wants to insure a sick kid then he's surely not going to purchase a policy from the Risk Pool. It's too darned expensive for the newly poor. Thank God Almighty that the Federal Government stepped in and is now offering coverage through the Federal Pre-existing Condition Insurance Program (www.pcip.gov) where standard PPO policies are offered at a reasonable price even for the sickest of kids. It's the only reasonable resource for parents in the middle class with kids with serious chronic illnesses like Downs Syndrome, Spina Bifida, mental retardation and a slew of other illnesses. And, that's a part of what you Republicans call Obamacare. The only time a parent can get good coverage for their kids, sick or otherwise, if they're struggling is to have a small business. Then there's the Healthy Texas program that came into being under the various Perry administrations. But still, to ensure a family with one of the PPO plans it's gonna cost more than a thousand dollars a month. And, many struggling families simply can't afford it. I was deeply offended and quite shocked to see you write such a misleading puff piece. Do try to do better.